NOTE: Accessing the survey through this link requires a NetBadge login to authenticate your identity. You will then be redirected to the external survey site managed by Westat, the research firm administering the survey on behalf of UVA. When you complete the survey, the link with your name, email, and IP address will be broken so that no one will be able to connect these with your survey answers. To further protect your privacy, when you finish the survey exit the Web browser completely by closing all tabs and exiting the program. The University of Virginia is one of 33 institutions participating in the 2019 Association of American Universities (AAU) Campus Climate Survey on Sexual Assault and Sexual Misconduct, which is being administered by the research firm Westat. The survey field period is March 19-April 16 and all degree-seeking undergraduate, graduate, and professional students will be invited to participate. The 2019 Campus Climate Survey on Sexual Assault and Sexual Misconduct is designed to gauge students’ knowledge and beliefs about social situations and perceptions related to sexual misconduct at UVA, and about their knowledge of resources available at UVA. This survey also asks students about their experience with sexual misconduct, such as harassment, sexual assault, and other forms of violence. All responses are anonymous and participation is voluntary. Results from the survey will guide ongoing reviews of policies and services that support a healthy, safe, and nondiscriminatory environment on Grounds. Why me and what is this about? We are asking all degree-seeking students over the age of 18 at the University of Virginia (UVA) to answer a climate survey on sexual assault and sexual misconduct. The results will be used to guide policies that will encourage a healthy, safe, and nondiscriminatory environment on Grounds. Our goal is to make UVA as safe as possible by developing programs and services that prevent and end sexual assault and misconduct, as well as respond to these events when they do occur. This survey is an important tool for us to assess current programs and to shape future policies. The survey is sponsored by UVA in collaboration with the American Association of Universities (AAU). The AAU is a group of 62 leading research universities in the United States and Canada. AAU projects and programs focus on issues that are important to research-intensive universities, such as funding for research, research policy issues, and graduate and undergraduate education. Westat, a private research firm based in Maryland, is administering the survey and will be assisting in the analysis of the data. UVA is one of 33 higher education institutions participating in this survey. More information about this project and the list of participating schools is available on the AAU website. What will UVA do with the results? The results will be used to better understand the climate at the University of Virginia, the extent of sexual assault and misconduct among students, and the use of programs and services currently being offered. This information also will be used to make recommendations for changes to the policies and procedures related to preventing and handling sexual assault and misconduct at UVA. UVA plans to release the survey findings in a public report next fall. Like prior climate assessments, the report will not - and cannot - share identifying information. Why are you asking about these sensitive topics? Our goal is to foster a safe and supportive environment where students can flourish, both academically and personally. In order to understand the climate at UVA, we need to ask direct questions about topics that some may find sensitive. It is only by directly collecting this information from you that we will be able to prevent negative experiences and effectively respond when they do happen. You are invited to participate in a Web survey. This survey includes sections that ask about your knowledge and beliefs about social situations, perceptions related to sexual misconduct at UVA, and your knowledge of available University resources. This survey also asks about your personal experience with sexual misconduct, such as harassment, sexual assault, and other forms of violence. Why is the language in the survey so explicit? Some of the language used in this survey is explicit, and some people may find it uncomfortable, but it is important that we ask the questions in this way so that you clearly understand what we mean. Information on how to get help, if you need it, appears on the bottom of each page and at the end of the survey. This survey is for all students, regardless of gender identity or experiences. The survey will be used to shape policies that affect everyone at the University, so it is very important that you provide your experiences and viewpoint. We want all students who receive this survey to complete it, and in appreciation for your time, we are offering modest incentives to encourage your participation. Westat created a stratified random sample of 5,000 students, who will be offered a $10 amazon.com gift card as an incentive for participation. This methodology allows the Westat researchers to conduct more nuanced analysis of potential nonresponse bias in the survey results. All other students who visit the survey website will be eligible to receive one of 200 $25 Amazon gift cards. I’ve never experienced sexual assault or sexual misconduct, so why should I take part? 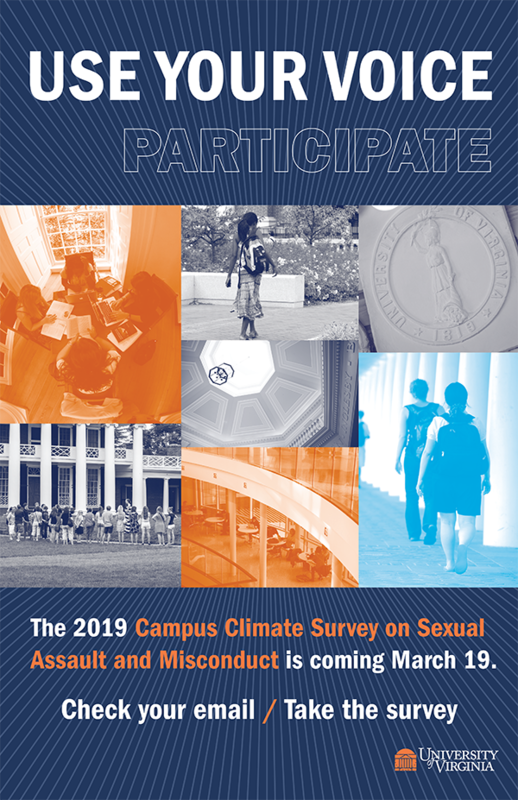 If only victims of sexual assault and sexual misconduct participate in the survey, we will not have a full view of the climate at the University of Virginia. To get a complete picture, we need to hear from as many students as possible. This survey should take most people approximately 20 minutes to complete. It may take up to 30 minutes for some individuals. You do not have to participate in this survey, and if you do participate, you may skip any question you are not comfortable answering. You may exit the survey at any time. Yes. When you complete the survey, the link with your name, email, and IP address will be broken so that no one will be able to connect these with your survey answers. The results will be presented in summary form so no individual can be identified. However, if you provide identifying information in a text box, UVA may be obligated to follow up when it reviews results in October 2019. Westat have obtained a Certificate of Confidentiality (CoC) issued by the National Institutes of Health (NIH). The CoC is issued to protect the investigators on this study from being forced to tell anyone about your participation in this study, even under a subpoena. What should I do if I become upset answering these questions? On each page of the online survey, there is a link to on- and off-Grounds resources that you can contact if you become upset. In addition to local resources, there is information for several national services, which provide information and counselors 24 hours a day, seven days a week. We have included a variety of resources so you can choose to contact the one you think would be most helpful to you. If you have any questions about this study, you can call the study Help Desk at 1 (855) 793-5324. To obtain more information about the study, ask questions about the research procedures, express concerns about your participation, or report illness, injury or other problems, please call (434) 924-5999.